Moving Beyond Open Plan Spaces - what's ahead! Recently, numerous articles within the design media have called into question the effectiveness of open plan workspaces. A more critical inquiry into the topic, however, might explore the following: Why are so many companies still using an outdated planning approach that doesn’t suit their employees’ needs? The open plan concept popular more than a decade ago has since been enhanced with smarter, more advanced planning models. Not only has the nature of work evolved dramatically since the heydays of the open plan in early 2000’s, so too has our understanding of how workspaces can foster engagement, satisfaction, and productivity. Today, most work environments have evolved a generation beyond open plan spaces to Activity-Based Workplaces (ABW) and Neighborhood-based Choice Environments (NCE). And the most progressive companies are evolving even further to adopt Maker Environments, Mobile Occupants (MEMO) space and Immersive Environments. These new strategies challenge the traditional approach to office planning, and for good reason. Gone are the days when the workplace was a static environment, where employees arrived at the same spot each day to perform the same routine task. Today’s space solutions need to be varied enough to accommodate a vast set of needs while also being able to change rapidly. Moreover, the workplace must reflect the needs of the organization and its people. An office space for a company that is sales oriented—in which employees are frequently out of the office—needs to function differently than a workplace for a creative business or research organization that requires employees to collaborate and share daily. Yet many companies still operate their workplace with a one-size-fits-all approach that fails to address how their workers, who are both their greatest asset and expenditure (see graphic), use the space. This, in addition to the latest poll from Gallup in which 68 percent of employees admit to being disengaged at work, adds up to a simple conclusion: any savings a company might expect to realize by keeping its outdated workplace can easily be dwarfed by the business costs that an ineffective workplace has on employee productivity and satisfaction. So, how does a company know which type of workspace solution is right for its employees? A design firm or workplace strategist is a good place to start. They can help an organization identify the unique DNA of the company and the specialized groups within it and tailor the environment to meet everyone’s specific needs. As we continue to shift from a commodity-based to an experience-based society, place takes on a new importance. The office as we know it needs to evolve to stay relevant. We need to create environments that support a variety of work styles and activities that foster innovation and improve productivity. Now, more and more organizations are looking to create curated experiences that meet the needs of their staff. These curated experiences often provide employees with an à la carte workplace experience with options including services, location, and support. Most offices are designed to support sedentary behaviors, yet as previously discussed, knowledge workers of today are no longer doing repetitive tasks that require them to sit in one place all day. Hence, over the past decade, we have seen the creation of the Activity-Based Workplace (ABW). This office concept creates task-oriented solutions that encourage movement and empower people to select the right space for the job at hand. ABW environments are typically designed to be an ecosystem of spaces, primarily grouped to serve four major work functions: solo work, collaboration, learning, and socializing and rejuvenation. It is increasingly common to find work environments with centrally located social hubs and designed with a food component and neighborhoods of work points including phone booths and team areas nearby. As people move more throughout the space, they need to have access to task-specific solutions. This requires that we stop designing spaces that support a single workspace per employee and design spaces that encourage people to be flexible and less place dependent. The ABW concept first originated in Europe and Australia where many companies are now on their fourth and fifth iteration of this agile space concept. Some have developed beyond ABW spaces to create Neighborhood-based Choice Environments (NCE). These spaces create a neighborhood or home for teams to operate out of while still allowing people to have access to a variety of work settings. Having a team base where employees can connect and have a sense of belonging and identity is important to all. Sitting stagnant in one place all day is mind-numbing. Observation also has shown that giving employees an assigned space tends to tether them to that area while other areas of the office get used less and less. People need periodic reprieves so they can rejuvenate. The old expression “get a fresh perspective” was meant literally. People like to have choices and options. One of the misconceptions of unassigned workspaces is that people cannot sit in the same area, or even the same spot, every day. Movement is, of course, encouraged within unassigned workspaces, but sitting in the same spot every day is permissible if it suits the individual worker or group. NCE spaces create a sense of community and place that meets our territorial instincts. 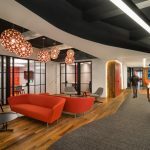 These environments enable people to connect while providing them with a sense of belonging and identity that accommodates a variety of preferences while meeting the needs of the business and the individual. Some employers have voiced concern that an ABW or NCE approach might lead to excess noise within the office. It is a misconception, however, that employees prefer quiet spaces. Quite frankly, dead quiet spaces are often eerie and lack energy. People typically work best when there’s a general hum in the background. In fact, a problem with many spaces is a lack of background noise, which leads to spaces where employees can clearly hear all their colleagues’ conversations. This can be a far bigger distraction than a general hum of voices within the workspace. The ability to control distraction and signal when you’re available for conversation is key to being able to do concentrative, thoughtful work and are critical components of successful NCE workplaces. HOK provided a workplace strategy and interior design for the two office buildings and research lab that make up this new 1,400-employee corporate campus. Leaders at Sealed Air, a global packaging firm, wanted the company’s new headquarters to foster a positive workplace culture, promote cross-divisional collaboration and facilitate interdisciplinary research. HOK led the development of a solution that reimagined how Sealed Air’s people work by moving them to unassigned individual spaces. Business groups and teams occupy flexible neighborhoods with formal and informal collaboration spaces. Depending on their needs for the day, employees can choose to use an open workspace, open or enclosed meeting room, or private room for heads-down work. Skylights draw natural light into a common reading room where staff can meet, reflect, and collaborate. Photo by Eric Laignel – Courtesy of HOK. The four neighborhoods within this floor plan each provide up to 48 employees with a choice of work settings. Photo courtesy of HOK. The entire campus is shared by all employees, with amenities including a central cafeteria, outdoor dining spaces, a coffee shop, a fitness center, two ponds, and walking trails. To celebrate curiosity and promote interdisciplinary research, the design arranges all labs in functional clusters instead of divisional boundaries. These clusters include engineering, electronics, industrial, showcase and traditional wet labs. An innovation center provides an area where Sealed Air can demonstrate its products to clients. The highly flexible space can accommodate up to 40 visitors. Touchscreen technology displays Sealed Air products in use around the world. Display areas have sliding doors that can open or close to show appropriate equipment for specific visitors. Breakout spaces can be configured for large or small groups. The high-tech office and scientific workplace is counterbalanced by high-touch elements that bring outdoor and organic elements into the space. The design integrates daylight and views to the outside, plants, and furniture made from wood harvested on the site. The Hub integrates natural materials and residential furnishings into a social space where employees can rejuvenate. Photo by Eric Laignel – Courtesy of HOK. On a parallel path, co-working spaces have emerged as an alternative to traditional corporate work environments. In recent months we’ve seen co-working continue to evolve and expand into new business models and settings. Developers, for example, are starting to allocate space within their buildings to serve as shared community/co-working spaces. These spaces are an amenity that attract and connect tenants, just as fitness centers once did. And with more than 50 percent of co-working occupants now being employees of larger companies, these third-party spaces are leading corporations to rethink their workplace strategy. For companies looking to expand in challenging markets, such as Asia, co-working allows them flexibility to adjust to rapidly changing space needs. But increasingly people are questioning whether the new “big-box” co-working spaces are delivering on what was promised or if they are descending into homogenized pre-packaged solutions where 90 percent of the space is dense benching and the community space decreases. Many companies are looking to replicate the best practices of the co-working experience within their own space, yet keeping their corporate identity, brand and culture. The rise of the creative offices and maker spaces, coupled with the introduction of community managers to service the corporate space needs, is bringing a new wave of competition to co-working environments as well. As noted in our recent article “It’s Time for a Workplace Attitude Adjustment,” there are many factors contributing to the alarming number of today’s dissatisfied and disengaged workers. Poor or misapplied space solutions; lack of protocols or leadership; environmental factors (too hot, too cool); and poor lighting may all contribute to user frustration. It cannot be denied that attitude, too, also plays a major role in workplace satisfaction. People influence people. A study by the Harvard Business School (in collaboration with Cornerstone OnDemand) found that dense workspaces with productive employees also raised the productivity and effectiveness of workers located nearby. Conversely, workers who sat near disgruntled “toxic” workers, were negatively impacted by a “spillover effect.” The sphere of influence diminished outside a 25-foot radius. When that measurement is applied to the typical modern workplace (in which each employee is generally allocated 150 square feet), one disengaged worker has the potential to negatively influence 16 coworkers without ever leaving his or her desk. This is a compelling argument to give others the choice to move if they so desire. So, how do companies determine the right solutions that address the needs of an increasingly mobile workforce; combat the traditional models of space delivery; and create a great experience for teams while avoiding the homogenization of pre-packaged co-working solutions? Immersive Environments pull the best lessons learned from work spaces—including open plan, co-working, ABW, NCE, and MEMO—and tailors them to meet the specific needs of a company to create tailored spaces. They are less about what is trending and more focused on desired functions, outcomes, and creating compelling places. As the workplace continues to evolve from “open plan” to “immersive” spaces, we designers and workplace strategists need to continually assess it to determine what is working and what isn’t. We also must be willing to acknowledge the side effects and adjust to embrace the reality that different companies need different solutions. If we can capitalize on the lessons learned and focus on finding the right solutions, we can make where, and how, we work a powerful asset for business and the people who drive it.